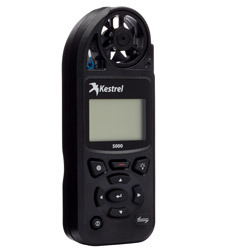 The anemometer AVM-5000 is a pocket anemometer that makes accurate measurements of environmental conditions. Because of its size and low weight, the anemometer AVM-5000 is a non-stationary device that can be used anywhere. By simply touching one single button of the anemometer, all relevant measurement values are delivered immediately. Because of this the anemometer is perfectly suitable for construction workers, employees working outdoors, technicians, water sports fans, farmers, and many others who depend on the weather or whose activities are influenced significantly by it. By making use of a simple anemometer like this, you can easily determine wind speed, temperature, wind chill, dew point, relative humidity of air, heat index, barometric pressure and high pressure air against NN. The anemometer indicates individual measurement values, minimum, maximum and average values. This measured data can graphically be displayed on the LCD. 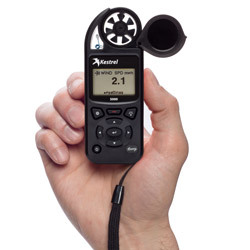 The anemometer is able to store up to 250 readings that include time and date stamps. When setting the anemometer you may choose between different time intervals. Despite its' size, the anemometer makes exact measurements with a measurement accuracy of ±3 % of the measured value. In addition to the the measurements can be made within a wide measurement range. The compass allows you to determine from which direction the wind is coming from. For further information on the anemometer, please read the following technical data or call our hotline: UK customers +44(0) 23 809 870 30 / US customers +1-410-387-7703. Our engineers and technicians will gladly advise you regarding the anemometer and all other products from the field of regulation and control, measuring instruments, scales or laboratory equipment by PCE Instruments. Workers working near large machinery that emit thermal heat energy are exposed to very high thermal stress. This phenomenon can cause physiological damage, fainting, muscle spasms, heart palpitations and even death. Therefore it is necessary to use a heat stress anemometer. This anemometer detects the temperature and compares it with the air environment. This result corresponds to the temperature that is noted in the body which relates to the ambient air temperature. Multifunctional display, multi-digit monochrome dot-matrix display. Choice of white or red LED backlight. The Wind Chill describes the difference between the measured and the perceived air temperature depending on air speed. We have another type of anemometer which can detect the Wind Chill and other parameters. The atmospheric pressure anywhere on our planet is the hydrostatic pressure of the air that prevails in that place. That pressure is equivalent to the weight of the atmospheric column that exists on the surface of the earth or over anybody that is in it. The average atmospheric pressure at sea level is 101325 Pa = 1013.25 hPa = 101.325 kPa, and is a part of normal conditions. The air could absorb more vapour with the increase in temperature. When the temperature of any element of air drops, and simultaneously the air humidity reaches 100%, the remaining vapour falls as rain. This limit is called the dew point. Buildings must be constructed in a way that the temperature in the low part of the building would never fall below the dew point. This prevents condensation of water that results in damaging buildings or in mould. The air currents that pass through the insulation are especially harmful. In these cases we must always expect a lower dew point. Also the wet bulb temperature, which plays an important role in the weather industry, is a very important parameter in many other sectors. The anemometer AVM-5000 is programmed to display 10 types of measurements (some are only estimates) in 3 modes. These measurements are listed below with their respective icons on the screen. Use the ▲ and ▼ button to move between different measurements. In the next picture you can see examples of each one of the screens of the anemometer AVM-5000, so they can cycle through different display modes with the use of ◄ and ►. The anemometer AVM-5000 can be used to make different measurements (wind speed, temperature, barometric pressure, relative humidity). In the left picture, you have the actual size of the anemometer AVM-5000 and its large LCD where you can see the performed measurements without any problems. 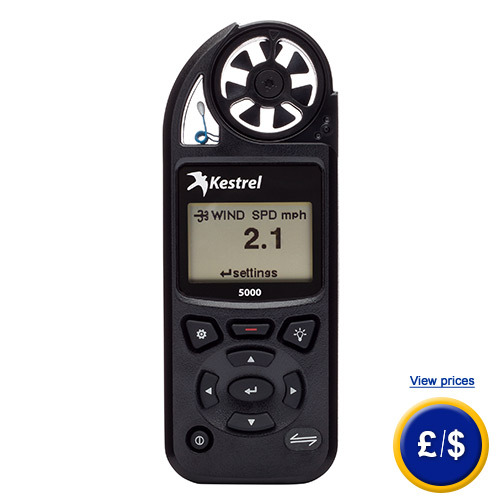 At the following link you can view a list of different types of anemometer for measuring air. A high precision temperature sensor allows quick temperature measurements with an accuracy of ± 1 ° C. The anemometer also has a sensor for relative humidity with an accuracy of +/-3% (in addition a calibration set is available for operations with optimal values of continuous measurement of moisture). The pressure sensor based on silicon monolithic allows to measure barometric pressure (res. 0.1 mbar). You can see the rest of the anemometer values derived from these basic units, such as the dew point etc., in the section "Technical specifications of the anemometer" (wind chill = perceived temperature, heat index, dew point, density). The familiar term wind chill is a combination of wind speed and temperature. A higher wind speed causes a greater sensitivity to cold. The rate of warming is a combination of humidity and temperature (hot humid air is perceived as much hotter than hot dry air). The dew point is the temperature (temperature threshold) where the humidity is deposited on objects that are colder than the air temperature. The atmospheric pressure is the weight of air in the atmosphere that exerts pressure on a particular point on the surface of the earth. Generally, the more air above an area is, the higher the pressure is. This means that atmospheric pressure changes with altitude. For example, atmospheric pressure is higher at sea level than at the top of a mountain. To compensate the pressure difference and facilitate the comparison between various locations with different altitudes, atmospheric pressure is usually adjusted to the equivalent of the sea level (barometric pressure). The barometric pressure varies with the weather, so this is an essential tool for weather forecasts. With this altimeter you will not have any problems taking the measurement of barometric air pressure. The air stream or draft is produced in the atmosphere by various natural causes. Wind is caused by differences in temperature that occur when there is uneven heating in several areas of land and atmosphere. These hot air masses tend to move up and replace the hot air by cooler air masses which are therefore denser. Wind is the term for the air current that moves horizontally, and flow is the term for the air that moves vertically. This anemometer can track the wind speed.